1. Don’t worry, there’s subtitles. You’re most likely going to see an opera sung in Italian, German, or French so unless you’re fluent in either, you’re probably wondering how you’re supposed to understand the story line. Fortunately, most opera companies (including yours truly), project subtitles above the stage called supertitles. But unlike a movie with subtitles, there isn’t going to be long lines of dialogue to follow. For opera, the emphasis is on the music and singing. If you find yourself getting lost in the music or an impressive aria and miss some supertitles, it’s okay. It’s all about finding your own enjoyment in opera and being present in the music and its emotion. Tip: Programs always have a show synopsis so it’s a good idea to review this before the performance–unless you hate spoilers! Okay, so applause is a bit tricky in opera since there’s much debate regarding when to clap. I remember the first time I saw the movie Marie Antoinette there’s a scene where the young queen is so moved by the end of an opera in Paris but finds herself clapping alone–the whole house looks at her like she’s crazy. Tip: Wait to see what other audience members do and follow suit. Unless they’re booing–that’s never nice. Take advantage of this break. Operas tend to be long at 2-3 hours or more. Use the restroom, grab a snack or drink (coffee, if you need it! ), stretch, or enjoy the opera house you’re in. When you see flickering lights or hear low chimes, it means the next part is going to start soon so best get back to your seat. These signals might be familiar if you’ve been to other long performances like ballets or plays. Also, definitely eat beforehand. Many evening performances of opera will start around dinnertime. “I’ve got nothing in my closet!” Chances are though, you probably do. Think nice dinner out or your Sunday best. Formal or semi-formal will not be out of place at the opera. It’ll also depend likely on what day and time you’re attending. Opening night and weekend evenings tend to be dressier over an afternoon performance. For your first opera, dressing up is a good way to go. Women, Men, or however you identify yourself: Dresses, skirts and blouses, dress pants and heels. Nice suit, sports jacket, think smart business casual. 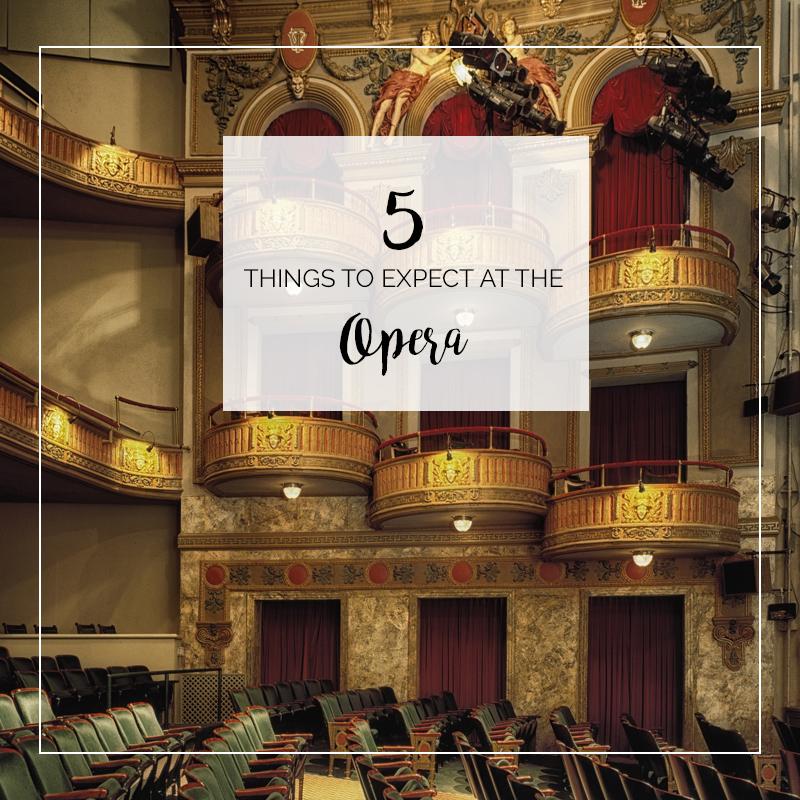 Opera performances are a chance to show off a bit, dress to impress, clasp those long pearl necklaces, maybe even dust off that tux (but it’s not required!). There will definitely be other opera attendees dressed to the nines so if you feel like it, go for it! Being comfortable is the most important thing. After your first opera (and we’re hoping you come back!) you’ll get a better feel about what to wear. Tip: Opera is the kind of event where it’s impossible to overdress. But, don’t spend a lot of money on an outfit you’re most likely not going to wear again. Being early is paramount in opera. If anything, timing is the most important thing for your first time. Most theatres won’t seat late patrons and you run the risk of missing the opening. No rush, no fuss – No running from the parking lot or stressing out your rideshare driver. If you are late, the ushers will hold you till the next intermission. But in case you’re late, they are playing the opera in the lobby of the theatre. Enjoy the theatre – Opera is an experience. From dressing up, arriving at the theatre, grabbing a drink and enjoying the space. Before the curtain rises enjoy the sights and sounds of the lobby and see the theatre before the house lights go down. Quick Study – With time to spare you can get to your seat and read the program. You can learn about the opera you’re attending and more about the company that put together a great show. We hope you enjoy your first opera!